Please see the agenda updates posted November 8th. Formal sessions for this event will be held at The Graduate Center, City University of New York (365 Fifth Avenue). Presenters include: Harry Benson, Photographer; Wendy Brandes, Jewelry Designer; Paula Crevoshay, Jewelry Designer; Ebonee Davis, Model and Activist; Talila Gafter, Pearl Jeweler, Ella Gafter; Mercedes R. Gonzalez, Founder & Director, Global Purchasing Companies; Rick Guidotti, Founder and Director, Positive Exposure; Daphne Guinness, Model and Collector; Bethann Hardison, Founder, Bethann Management Co.; John Hatleberg, Counterfeiter of Famous Diamonds for Their Owners; Keith Hoover, Apparel and Retail Executive; Donald Kaufman, Founder, Donald Kaufman Color; Mickey Alam Khan, Founder and Editor-in-Chief, Luxury Daily; John King, Chief Quality Officer, GIA Laboratory; Shaun Leane, Jeweler; Rachel Leonard, Editorial Director, The Bridal Council; Darcy Miller, Founder, Darcy Miller Designs, and Editor at Large, Martha Stewart Weddings; Jack Ogden, Jewelry Historian; Mary Orton, Co-Founder and President, Trove; Jacques Panis, President, Shinola; Jean Z. Poh, Founder and CEO, Swoonery; Zac Posen, Designer; Ralph Rucci, Designer; Charlie Scheips, Curator, Art Advisor, and Cultural Historian; Hedda Schupak, Editor, The Centurion Newsletter; Dennita Sewell, Curator of Fashion Design, Phoenix Art Museum; Hisano Shepherd, Designer, little h; Valerie Steele, Director and Chief Curator, The Museum at the Fashion Institute of Technology; Mara J. Urshel, Owner, Kleinfeld Bridal; Ronnie Vanderlinden, President, Diamex, Inc., Diamond Manufacturers & Importers Association of America (DMIA) and United States Jewelry Council; Robert Verdi, Celebrity Stylist; Gary A. Wassner, CEO, Hilldun Corp.; Wendy Waugh, Senior Vice President, Merchandising and Development, Fast Retailing; Chris Whipple, CEO, CCWHIP Productions; Walter T. Wilhelm, Chairman, WWA Advisors; Jason Wu, Designer; Barbara Zeins, President/COO, Gerson & Gerson, New York; Julie Zerbo, Founder and Editor-in-Chief, The Fashion Law; Benjamin Zucker, Precious Stones Authority. For further information regarding presenters, schedules and locations for events related to this conference, please see the following agenda. The agenda for this event follows this release. Those interested in attending can register at, https://www.eventbrite.com/e/white-tickets-37040888294. 10:15 – 11:00 a.m. To Make New Again: Designers as Advocates for Sustainability and Style. Gary A. Wassner, CEO, Hilldun Corp., in conversation with Jason Wu, Designer. 2:00 – 3:00 p.m. Blinded by the Light: Why Diamonds Matter. John Hatleberg, Counterfeiter of famous diamonds for their owners; John King, Chief Quality Officer, GIA Laboratory, Gemological Institute of America; Benjamin Zucker, Authority on precious stones; moderator, Jack Ogden, Jewelry Historian and Diamond Authority. 10:35 – 11:20 a.m. Contra Mundum: Creativity and Collaboration. Shaun Leane, Jeweler, and Daphne Guinness, Model and Collector; in conversation with Valerie Steele, Director and Chief Curator, The Museum at the Fashion Institute of Technology. 11:40 a.m. – 12:25 p.m. Sustainably Exquisite: Revolutionary Pearl Design.Paula Crevoshay, Jewelry Designer; Talila Gafter, Pearl Jeweler, Ella Gafter; Hisano Shepherd, Designer, little h; moderator, Hedda Schupak, Editor, The Centurion Newsletter. 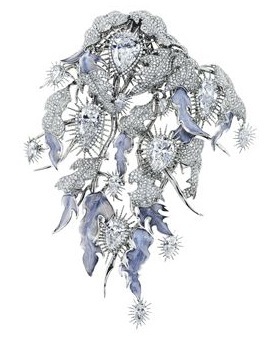 Image: Shaun Leane in collaboration with Forevermark Diamentaire, Steinmetz Diamonds, White Light' Brooch, diamonds set in 18 kt white gold and diamond collets and surrounded by a mount of branches and flowing pavé set enameled leaves.